SALT LAKE CITY (AP) — Patients can use medical marijuana legally in conservative Utah after a compromise agreement was signed into law despite concerns from advocates that it’s too restrictive, but they likely won’t be able to buy it legally in-state until at least 2020, officials said Tuesday. But people who go elsewhere to buy permitted forms of medicinal marijuana, like cube-shaped gummies and oils, with a doctor’s recommendation now have legal protections. “We did not want them to be considered criminals for the next year or two while they wait for the bureaucracy,” said Connor Boyack with the group Libertas Institute, who helped draft a legalization law passed by voters in November. Utah Department of Public Safety Col. Michael Rapich said troopers are being informed that “some things that were a crime before are not a crime.” He wants to support medical-marijuana patients who follow the new rules, but said troopers will also aggressively enforce DUI laws and investigate other suspected drug crimes. “If someone … makes sure they understand what the rules are and they are following the rules, they should be fine,” he said. 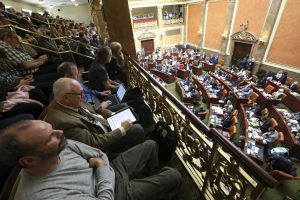 Lawmakers passed sweeping changes to the law Monday under a compromise deal that was arranged before Election Day and won the support of the influential Mormon church. Utah Gov. Gary Herbert quickly signed it into law, calling it the “best-designed medical cannabis program in the country,” and directed the state to implement it as soon as possible. The compromise cuts the number of private dispensaries from 15 to seven. But if the state doesn’t create its central dispensary by January 2021, more private licenses will begin becoming available. Desiree Hennessy with the Utah Patients Coalition said she wanted the original law to say intact, but the new one is a platform she’s hoping to build upon. Hennessy is planning to get a doctor’s letter to use medical marijuana to treat her son Hestevan, whose cerebral palsy leaves him with severe disabilities and bouts of nerve pain that leave him screaming for hours. Cannabis has been the only effective treatment, she said. “This is our one shot, so it’s pretty awesome,” she said.